If you would like any custom features please email me at info@clairvoyantfinancial.com! Minor bug fixes with alerts. Everyday you will receive a Top Ten list that includes the top ten stocks in the S&P 500 that have the highest probability of increasing in value. Our A.I. analyzes historical patterns of each security and the historical relationships between each security and their underlying sector, index, and volatility. 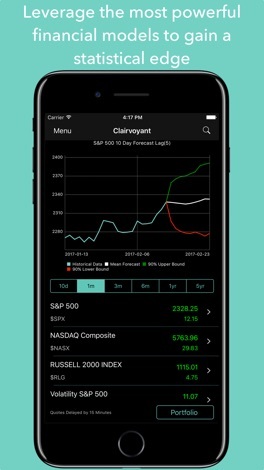 Clairvoyant has over 10 different forecasting tools that can be calibrated to capture your market views. 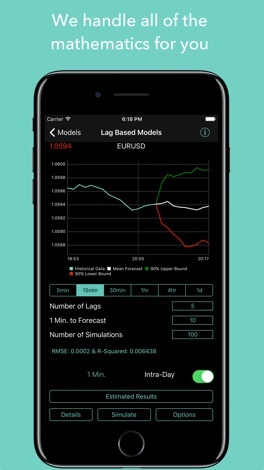 You can build price based forecasts or probabilistic based forecasts. For example, with a few simple taps you can build a forecast for the S&P 500 based upon the relationship between say the S&P 500, Volatility (VIX), and Gold Prices. Your forecast can be going forward a few minutes or a few months or can simply be to estimate the probability of the Apple stock increasing in value. The choice is yours! 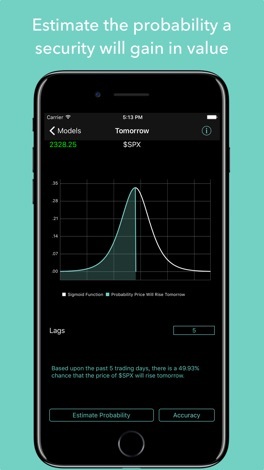 Leverage famous tools such as Black-Scholes to mathematically price options contracts or to view the probability of you making a profit on your options contract. Furthermore, leverage our forecasting tools to back out options prices and their associated probabilities of profitability. Use the work of Nobel Laureate Harry Markowitz to optimize your portfolio's. Reduce your risk and increase your returns through mean-variance optimization. We will show you how to allocate your money across your assets in a diversified manner that will give you insights into growing your wealth. We send you reminders to rebalance your portfolio based on some complex statistics going on in the background. We also provide for you a highlighted list of risk statistics about your portfolio. 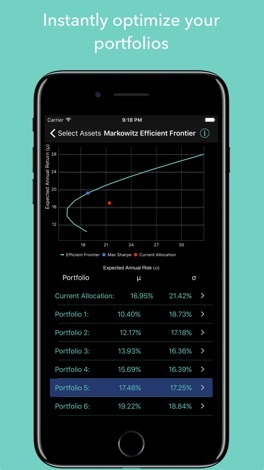 With our portfolio tracking you can estimate the likelihood of your portfolio gaining in value. 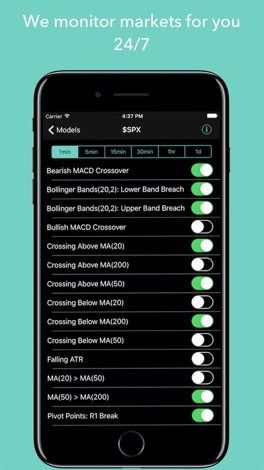 You can activate up to 144 technical indicators for any security! Our algorithms monitor financial markets for you 24/7 and we will send you alerts as soon as one of the patterns you request is detected by our algorithms. View and plot all of your favorite technical indicators. Furthermore, you can utilize our variable selection tools to tell you which technical indicators are best suited for the security you are analyzing. Get access to financial market screening by technical indicators down to the one-minute level. Find stocks that are exhibiting the patterns you are looking for and increase your profitability. Get access to historical company fundamentals to be sure the companies you are investing in are meeting your accounting criteria. Get a highlighted list of statistical risk factors associated with any security with two taps. We handle all of the mathematics in the background. Get access to high quality price quotes and historical daily/intra-daily data continuously streaming to your device. You have access to 1-minute, 5-minute, 15-minute, 30-minute, 1-hour, daily, weekly, and monthly OHLC data. Free to use basic models. To access all models: Weekly ($9.99), monthly ($34.99), quarterly ($95.99), or annual ($349.99) auto-renewing subscription. You can cancel your subscription at anytime up to 24-hours before the renewal date.